A 42-year-old Hispanic female was referred from her general dentist for evaluation of a leukoplakic patchy lesion of the right ventrolateral tongue [Figure 1]. The patient was unaware of this lesion and denied any associated symptoms. She had emigrated from Mexico only a few months prior. She was a poor historian who endorsed a limited medical history significant for asthma-related illness with a consistent cough as well as chronic back and musculoskeletal pain. Her surgical history was also significant for an unknown type of chest surgery approximately 12 months prior for which she had not followed up with the surgeon in Mexico. Current medications included Phenergan as needed for occasional nausea, albuterol and ipratropium bromide as needed for asthma-related symptoms, as well as tramadol as needed for chest pain from frequent coughing. She denied any history of alcohol, tobacco, areca nut, or recreational drug use. Clinical examination revealed a flat, 20 mm × 6 mm patchy leukoplakia on the right anterolateral tongue with no apparent tenderness. The lesion appeared keratotic without fluctuance, blanching, or mobility. It lacked signs of erythema and could not be wiped away using gauze. The tongue and oropharynx nonetheless retained their full range of motion including a proper swallowing reflex. The authors also noted class two mobility of all teeth from the patient's left mandibular canine to her right mandibular first premolar as well as poor oral hygiene. 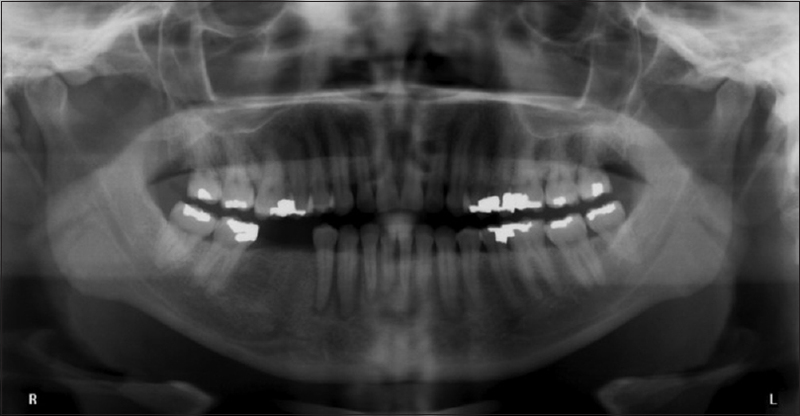 Panoramic [Figure 2] and periapical radiographs [Figure 3] concurred with an absence of visible lamina dura and periodontal ligament (PDL) on the same teeth. This was accompanied by a moderately diffuse swelling of the right mandible and vestibule without distinct masses or protrusions. The patient demonstrated poor-fair oral hygiene, somewhat limited 30 mm maximum interincisal opening, and otherwise reproducible occlusion. The extraoral examination was positive for regional lymphadenopathy with scattered, subcentimeter palpable nodes on the right submandibular and cervical lymph nodes. During palpation, the patient abruptly admitted to anesthesia of the right mandible and chin. Subsequent vitality testing also indicated that all teeth from the left mandibular canine to the right mandibular third molar were negative to both electric and thermal pulp tests. The patient estimated that the numbness was present for several months in duration without any changes in character. She did not believe this symptom was unusual and was otherwise an infrequent medical or dental patient. The patient also denied any other systemic medical comorbidities but stated that she had felt fatigued for the past several months with a concurrent unintentional weight loss of approximately 20 pounds. Given her vague but concerning medical history, the patient was urgently referred to her primary medical clinic for a complete physical examination, to determine the nature of her prior chest surgery, and to undergo laboratory testing to rule out underlying systemic diseases. Five months following her initial oral surgery consultation, she returned with complaints of persistent numbness on her lower right lip and chin, very loose teeth from her left mandibular first premolar to her right mandibular second molar, and purulent drainage in the area of her missing mandibular right second premolar and first molar. The alveolus in this edentulous area was doughy and edematous to palpation with expressible purulent discharge through a 5 mm crestal gingival dehiscence. 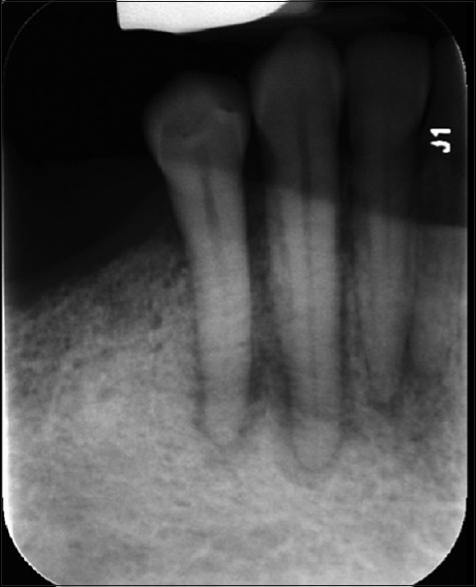 After a repeated, emergent recommendation to seek primary care, a new panoramic radiograph was taken at this visit [Figure 4] to reveal additional loss of lamina dura and widening of the PDL on all dentition from the left mandibular first premolar to the right mandibular second molar. A cone beam computed tomographic scan [Figure 5] revealed areas of permeative bone changes and nonuniform PDL widening at the mesial and distal peripheries of all teeth from the left mandibular second premolar to the right mandibular second molar. On axial view [Figure 6], irregular interruption of the buccal cortical plate with no expansion of this same area was noted. Only the lingual aspect of the right mandibular canine showed an interruption of the lingual cortical plate with no expansion. Areas of the right and anterior mandible showed slightly higher density, with more sclerotic calcifications than the contralateral side. A minimally invasive local biopsy was taken in an effort to accelerate the patient's diagnosis and to help provide comprehensive data on the presenting symptoms. Under local anesthesia, needle aspiration of the edentulous space of the right mandible (second premolar – first molar area) was found to be negative for any type of fluid. Surgical exposure of the area yielded dry, avascular bone and areas of doughy, friable soft tissue that bled heavily on manipulation. A surgical sample was taken from the tongue soft-tissue lesion as well. The biopsy specimens were evaluated by an oral and maxillofacial pathologist and a medical pathologist who both agreed on its histopathologic findings. Microscopy revealed in fibrotic stroma between osseous trabeculae demonstrating infiltrative slender cords, islands, and small sheets of neoplastic epithelial cells; lesional small polygonal carcinomatous cells exhibiting intermixed small dark polygonal nuclei and larger oval pale nuclei with finely-divided, evenly-dispersed chromatin; nuclear molding; small nucleoli; modest eosinophilic cytoplasm; and distinct cytoplasmic borders [Figure 7]. Among disordered lesional, cells were moderate variations in nuclear size, shape, and chromaticity, with a low mitotic index. Also noted were segments of necrotic remodeled resorbed lamellar bone showing enlarged empty osteocytic lacunae, a serrated external surface (exhibiting osteoclastic lacunae), adherent granular basophilic bacteria (biofilm), and a fibrinous exudate with neutrophils (purulent exudate) [Figure 8]. The authors also received copies of the patient records after a comprehensive physical examination and systemic medical work-up with laboratory testing. The records revealed a past bilateral mastectomy for primary breast cancer (BC) with concurrent use of an undocumented antiresorptive medication for then-suspected bony metastases. The records also outlined current BC (estrogen receptor-positive and human epidermal growth factor receptor 2 negative) with verified metastases to her lungs, neck, pelvis, and shoulders. The primary care provider reportedly began an immediate daily chemotherapy regimen consisting of palbociclib 125 mg, letrozole 2.5 mg, and leuprolide. The patient underwent prompt radiotherapy to her pelvis in an attempt to control the spread of disease and to alleviate her hip/pelvic pain. She also underwent thoracentesis to improve her breathing that was compromised secondary to malignant pleural effusion. Given the known history of widespread BC, the clinical and histologic features of this jaw tumor were interpreted to represent disseminated metastatic breast carcinoma. 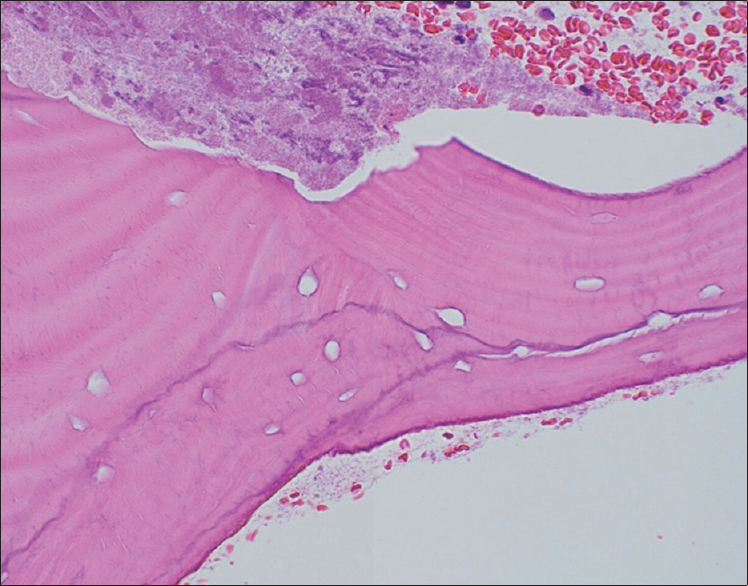 Intriguingly, evidence of osteonecrosis initiation was also observed in the form of necrotic, serrated bone at several peripheries of the epithelial lesion. With a lack of recent local infection, fevers, chills, or jaw trauma, and in light of the past antiresorptive therapy, a concurrent diagnosis of medication-related osteonecrosis of the jaw (MRONJ) was also made with the metastatic process considered the triggering traumatic agent. The patient expired 2 weeks following jaw biopsy from her underlying disease. BC is an uncontrolled proliferation of the ductal or glandular structures of the breast that may metastasize to distant sites such as bone or the lungs. It is one of the most common cancers affecting women with more than a million cases diagnosed each year. As of the early 21st century, it represented the second leading cause of cancer death of American females, particularly in those with histories of BRCA gene mutations, contraceptive or hormone use, advanced age, and alcohol use., The vast majority of patients are diagnosed with ductal or lobular carcinomatous lineages, with the invasive ductal variant making up more than half of all malignant presentations. Breast invasive ductal carcinoma (BIDC) also remains the most common metastatic entity to the jaws in women with symptoms including pain, swelling, paresthesia, anesthesia, halitosis, and trismus., However, BC or BIDC mimicking periodontal disease (PD) – with widespread alveolar bone loss – is seldom documented, as are visible soft-tissue metastases outside of the jaw bones. The current case of BC was especially unexpected because of its co-presentation with MRONJ at the same site. A recent report by Corsi et al. discovered only ten such cases of MRONJ and metastatic BC within the same site, and other groups have also attested to the remarkable difficulty of discovering MRONJ at sites of oral metastases., Although the exact mechanism is difficult to ascertain, some investigators stipulate that osteolytic diseases such as BC can induce MRONJ-like symptoms by de-coupling bone formation and resorption. These pathologies could theoretically increase the local levels of matrix metalloproteinases and insult the osteoblastic/osteosupportive cells in an environment already saturated by bisphosphonates. Regardless of these co-presentations, diagnosing metastatic lesions of the jaws can be difficult. Both malignant and benign pathologies have been known to produce diffuse decortication and loose dentition, although noninfectious, nonmalignant conditions do not often induce loss of endodontic vitality. Poorly controlled mandibular infections could form ill-defined bony radiolucencies with trismus but are rarely associated with cervical lymphadenopathy. Moreover, while necrotic conditions like MRONJ can induce swelling and sensational deficits, they do not independently lead to rapid weight loss and bilateral dental mobility. Malignancies in the oral cavity remain distinct entities because of their ability to cause localized changes in dental, neuronal, and osseous integrity as well as more widespread disruptions of the lymphatic, metabolic, and visceral systems. The latter three are critical indicators of widespread disease and should raise alarm to any dental provider. A patient who is a poor medical historian with a history of unknown surgeries and idiopathic pain requiring medication should stir concern beyond the original presentation of a disconcerting lingual leukoplakia. Unfortunately, in this case, the patient's self-neglect and the extremely advanced presentation limited the options available to prevent a fatal course. A detailed interview and review of all available information is necessary for every patient to reduce the greatest number of disease-related morbidity and mortality. PD remains one of the most common diseases not just of the jaws but also of the entire human body. 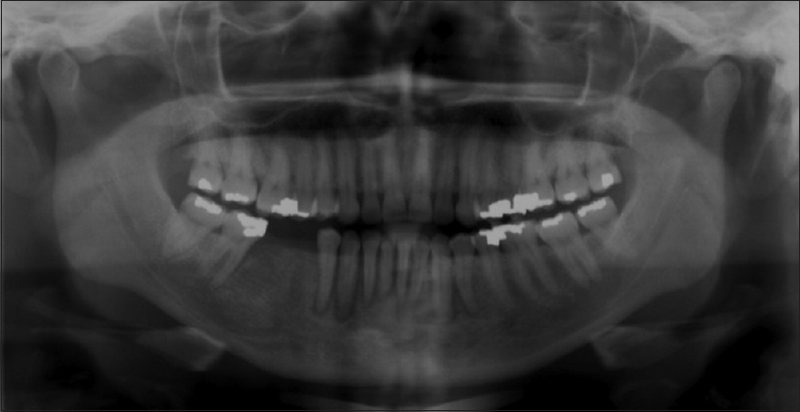 PD is defined as the progressive destruction of the alveolar bone surrounding teeth, which in advanced stages may lead to PDL space widening and dental mobility as observed in this patient. In general, diseases of the periodontium precipitate from bacterial colonization of the gingivae or pulp that spread from their original sites of infection to cause radiolucent erosion. PD is an extremely common condition which reportedly affected more than 10% of the US population in 2010, especially among individuals of lower socioeconomic status. Its ubiquity and close association with poor oral hygiene dictates that PD be given reasonable consideration when considering widespread radiolucency of the periodontium accompanied by mucosal suppuration. However, even though PD can have adverse multiple body system interactions, PD remains a relatively localized disease of the oral cavity and presentations such as regional lymphadenopathy, and sudden weight loss are quite unusual. Anesthesia and involvement of neuronal tissue are also highly atypical, and likely indicate a much more sinister pathology. Compared to PD, OM represents a much more aggressive manifestation of the bony infectious process. It is an active bacterial – and occasionally fungal – colonization of the bone that stems from bacteremia or penetrating insults such as those from odontogenic diseases. This infectious process is often characterized by the presence of bony sequestrae and can be categorized according to the length of disease and the presence of suppuration. All variants of OM can present with overlying erythema, swelling, pyrexia, weakness, and pathologic fracture that lead to significant morbidity and mortality without surgical debridement accompanied by aggressive antimicrobials., Along with its predilection for the mandible, intraoral OM shares similarities to the current case such as the presence of diffuse cortical destruction, regional sensory disturbances, and PDL space widening. These similarities are nonetheless contradicted by the fact that OM appears to present more commonly in males and in younger age groups. Perhaps more importantly, a diffuse bilateral presentation across the entire mandible usually presents in a compromised host with nutritional deficiencies stemming from the likes of diabetes, anemia, and/or alcoholism. This patient appeared unaffected by the stated deficiencies, odontogenic infections, or recent trauma that could have resulted in osteomyelitic facial asymmetry especially without unmistakable suppuration as well as pyrexia. In contrast, CC represents a distinctly malignant pathology that can also present with the noted aggressive symptoms. CC was first described in 1954 by Aird et al. who observed an unusually well-differentiated variant of squamous cell carcinoma of the foot. Like its common squamous cell cousin, oral CC appears to be closely correlated with tobacco and alcohol consumption as well as symptoms including pain and swelling., A study of Japanese patients revealed that CC may also spread through lymph node metastases and that regional lymphadenopathy could be observed. However, unlike traditional squamous cell carcinoma, CC is considered a locally aggressive lesion with a propensity for creating hollow, crater-like “rabbit burrows” into bone that are filled with radiolucent keratin., These irregular sinuses of tumor invaginations often initiate clear surface-to-deep penetrations that could result in endophytic lesions reminiscent of the soft-tissue invaginations in this patient surrounding mandibular teeth sockets. The epithelial origin of CC has also been linked to a premalignant presentation of visible leukoplakia. 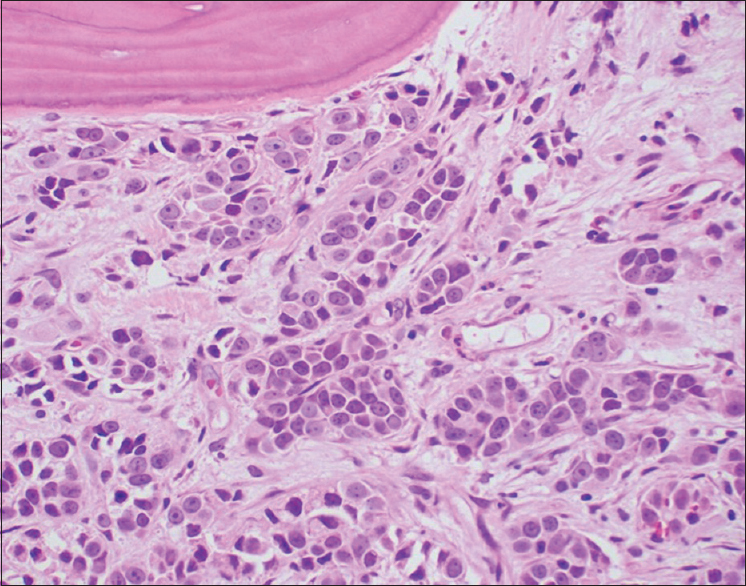 Still, CC itself also remains an exceedingly rare lesion – with a predilection for skin over mucosae – that consists of only 2.7% of all oral squamous cell carcinoma and approximately 0.08% of all malignancies in the United States.,, Its rarity, slow spread, and limited mitoses are indicators of a relatively localized cancer without the rampant involvement of lymph nodes or the contralateral anatomy. NHL denotes a common, broad classification of lymphoma that make up approximately 90% of all lymphomas., Most types of NHLs manifest with lymphadenopathy and unexplained weight loss in individuals beyond the 5th decade of life. It is also an established disease of the oral cavity at approximately 3% of all oral malignancies and 2.5% of the total cases of lymphomas., In all, diffuse large B-cell lymphoma (DLBCL) remains the most likely and pervasive type of NHL with more than 60% of cases attributable to DLBCL. This specific type readily presents with progressive swelling, diffuse bone destruction, tooth mobility, and sensational disturbances , to induce facial asymmetry, generalized alveolar bone loss, and numb chin syndrome. The average DLBCL demographic, however, remains within the geriatric age group with a distinct preference for men over women., Its proliferation from the leukocytic lineage also suggests that both DLBCL and NHL cases without immunological or hematological symptoms are unusual. Patients with multiple nodal and extranodal metastases but without other systemic issues would be unexpected. Unlike the aforementioned entities, MRONJ is a recently discovered phenomenon typically initiated as a treatment complication. It occurs as a result of medication-induced deactivation of osteoclasts – and therefore, bone turnover – that leads to osteonecrosis in the aftermath of traumatic events. 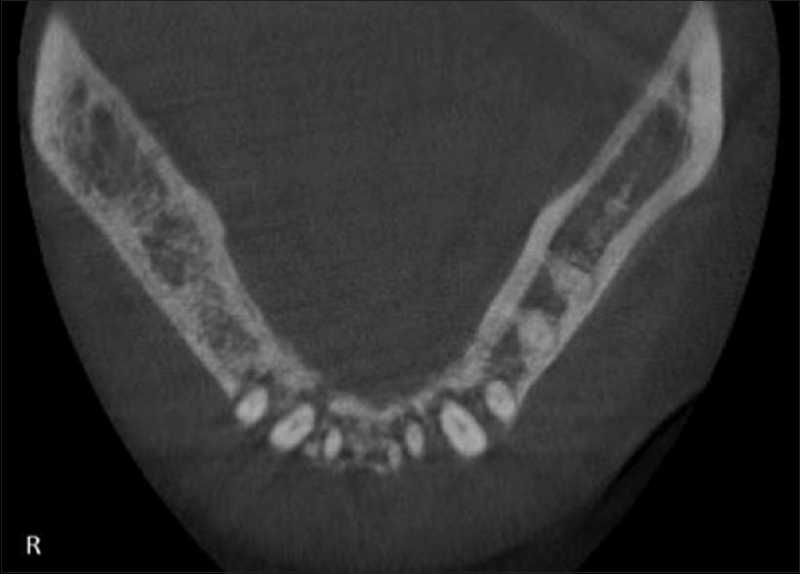 The diagnostic criteria of MRONJ include current or previous treatment with antiresorptive or antiangiogenic agents, exposed intraoral bone that has persisted for more than 8 weeks, and a lack of radiotherapy to the head and neck region., The phenomenon is traditionally associated with bisphosphonates, which in turn was frequently utilized to reduce bone pain in existing or imminent intraosseous metastases of malignancies such as BC. MRONJ is also a known precipitator of hemimandibular paresthesia or anesthesia, swelling, dental mobility, and PDL space widening that can lead to osteolysis extending the full thickness of the mandible.,, While a history of antiresorptive therapy can predispose our patient to MRONJ, osteonecrosis does not typically induce significant weight loss or bilateral dental mobility. MRONJ alone would also be an unlikely trigger of cervical lymphadenopathy except in cases of radiographically evident, large-scale infections in the areas of osteonecrosis. The authors would like to thank Lee J. Slater, DDS, MS (Staff Pathologist, Scripps Oral Pathology Service, San Diego, CA, USA) for his assistance in the histopathologic evaluation and preparation of the manuscript. Eheman CR, Shaw KM, Ryerson AB, Miller JW, Ajani UA, White MC, et al. The changing incidence of in situ and invasive ductal and lobular breast carcinomas: United States, 1999-2004. Cancer Epidemiol Biomarkers Prev 2009;18:1763-9. Ording AG, Garne JP, Nyström PM, Cronin-Fenton D, Tarp M, Sørensen HT, et al. Hospital recorded morbidity and breast cancer incidence: A nationwide population-based case-control study. PLoS One 2012;7:e47329. Edlich RF, Winters KL, Lin KY. Breast cancer and ovarian cancer genetics. J Long Term Eff Med Implants 2005;15:533-45. Frei M, Bornstein MM, Schaller B, Reichart PA, Weimann R, Iizuka T, et al. Bisphosphonate-related osteonecrosis of the jaw combined with jaw metastasis of prostate adenocarcinoma: Report of a case. J Oral Maxillofac Surg 2010;68:863-7. D'Silva NJ, Summerlin DJ, Cordell KG, Abdelsayed RA, Tomich CE, Hanks CT, et al. Metastatic tumors in the jaws: A retrospective study of 114 cases. J Am Dent Assoc 2006;137:1667-72. Corsi A, Ungari C, Riminucci M, Agrillo A. Bisphosphonate-related osteonecrosis and metastasis within the same site of the jaw. J Oral Maxillofac Surg 2017;75:1679-84. Carlson ER, Fleisher KE, Ruggiero SL. Metastatic cancer identified in osteonecrosis specimens of the jaws in patients receiving intravenous bisphosphonate medications. J Oral Maxillofac Surg 2013;71:2077-86. Mortazavi H, Baharvand M. Review of common conditions associated with periodontal ligament widening. Imaging Sci Dent 2016;46:229-37. Sencimen M, Bayar GR. A large expansion in the mandible: Clinical features and differential diagnosis. J Can Dent Assoc 2011;77:b58. Bar-Ziv J, Slasky BS. CT imaging of mental nerve neuropathy: The numb chin syndrome. AJR Am J Roentgenol 1997;168:371-6. Shapiro MC, Wong B, O'Brien MJ, Salama A. Mandibular destruction secondary to invasion by carcinoma cuniculatum. J Oral Maxillofac Surg 2015;73:2343-51. Sun Y, Kuyama K, Burkhardt A, Yamamoto H. Clinicopathological evaluation of carcinoma cuniculatum: A variant of oral squamous cell carcinoma. J Oral Pathol Med 2012;41:303-8. Ramanathan A, Mahmoud HA, Hui LP, Mei NY, Valliappan V, Zain RB, et al. Oral extranodal non Hodgkin's lymphoma: Series of forty two cases in Malaysia. Asian Pac J Cancer Prev 2014;15:1633-7. Okahata R, Shimamoto H, Marutani K, Tomita S, Nakatani A, Kishino M, et al. Diffuse large B-cell lymphoma of the mandible with periosteal reaction: A case report. Oral Surg Oral Med Oral Pathol Oral Radiol 2014;117:e228-32. Blus C, Szmukler-Moncler S, Giannelli G, Denotti G, Orrù G. Use of ultrasonic bone surgery (Piezosurgery) to surgically treat bisphosphonate-related osteonecrosis of the jaws (BRONJ). A Case series report with at least 1 year of follow-up. Open Dent J 2013;7:94-101. Yamachika E, Matsubara M, Ikeda A, Matsumura T, Moritani N, Iida S, et al. Treatment of osteonecrosis of the jaw. J Craniofac Surg 2015;26:e575-7. Jung S, Martin T, Schmittbuhl M, Huck O. The spectrum of orofacial manifestations in systemic sclerosis: A challenging management. Oral Dis 2017;23:424-39. Burnett MW, Bass JW, Cook BA. Etiology of osteomyelitis complicating sickle cell disease. Pediatrics 1998;101:296-7. Peravali RK, Jayade B, Joshi A, Shirganvi M, Bhasker Rao C, Gopalkrishnan K, et al. Osteomyelitis of maxilla in poorly controlled diabetics in a rural indian population. J Maxillofac Oral Surg 2012;11:57-66. Schmitt SK. Osteomyelitis. Infect Dis Clin North Am 2017;31:325-38. Aird I, Johnson HD, Lennox B, Stansfeld AG. Epithelioma cuniculatum: A variety of squamous carcinoma peculiar to the foot. Br J Surg 1954;42:245-50. Jalil Ab, Hin-Lau S. Oral langerhans cell histiocytosis in malaysian children: A 40-year experience. Int J Paediatr Dent 2009;19:349-53. Smith A, Howell D, Patmore R, Jack A, Roman E. Incidence of haematological malignancy by sub-type: A report from the Haematological Malignancy Research Network. Br J Cancer 2011;105:1684-92. Van Acker HH, Anguille S, Willemen Y, Smits EL, Van Tendeloo VF. Bisphosphonates for cancer treatment: Mechanisms of action and lessons from clinical trials. Pharmacol Ther 2016;158:24-40.